Author. Motivational Speaker. Superhero. Jamie McDonald. Author. Record Breaker. Fundraiser. Superhero. Against all odds, Jamie McDonald has become something of an Adventurer. Something of a Superhero. Follow me on my latest adventure, running 6,000 miles across the United States to raise money for children’s hospitals. Real-life superhero and Pride of Britain Award-winner Jamie McDonald, whose global goal is to ensure no child goes without treatment they need but can’t access or afford, is more than 3,400 miles into a 6,000-mile west coast-to-east coast run across the United States, dressed as the superhero Adventureman. He finally stepped off the exercise bike set up within a marquee in Gloucester after pedalling for a world record breaking 268 hours – more than eleven days. 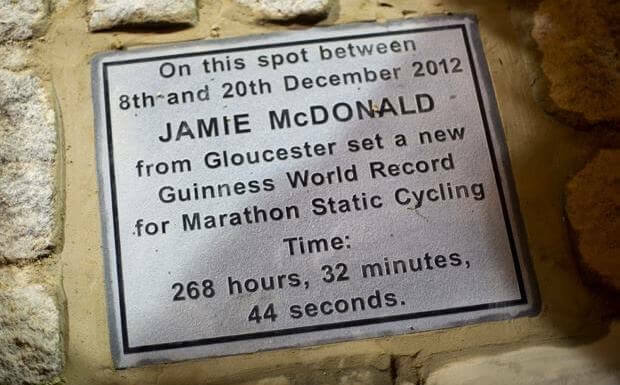 Throughout both challenges, Jamie raised tens of thousands of pounds for a charity that benefits the children’s ward of Gloucester Royal Hospital. In February 2014, Jamie finished an historic journey across Canada, becoming the first person in history to run the 5,000 miles from the Atlantic coast to the Pacific coast without the aid of a support crew. Starting in March 2013, his run raised more than £250,000 for sick children in Canada and the UK. He battled -40°C temperatures, the Rockies, a frostbitten nose, numerous potentially challenge-stopping injuries (including the permanent misshaping of his right foot) and more to finish in Vancouver, running the equivalent of a marathon most days – whilst wearing a Superhero costume The Flash. Yup, one costume the entire time – mental. He filmed his journey all the way across to create a short, BBC documentary. His adventures have made news (feel free to have a gander at some of his interviews) all over the world! In-between adventures, Jamie cites current and future generations to achieve, as a huge motivation. Since he has created a new Superhero, Adventureman, inspires people through Motivational Speaking, and hopes to continue to inspire and empower people through his charity: Superhero Foundation. Out now, Jamie has a best selling book called: Adventureman: Anyone Can Be a Superhero – which you can order here. Right now, he’s taking on his biggest challenge yet, running, solo across the U.S (that’s more than 230 marathons!). 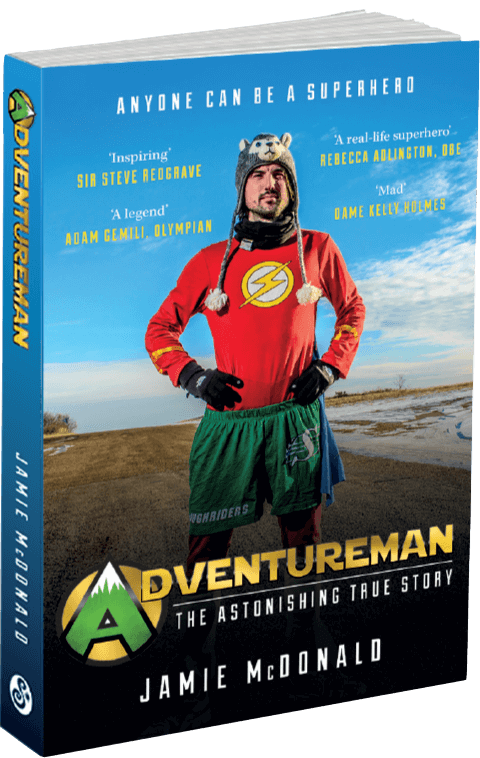 Jamie has inspired thousands across the world, read his full story in his bestselling book: Adventureman – Anyone can be a superhero. Some of the wonderful things Jamie has received in recognition. Guinness World Record for ‘Marathon Static Cycling’, pedalling for 268 hours (more than 12 days) ~ 2013. White Hatted in Calgary (in previous years the likes of Prince William, Kate Middleton, Arnold Schwarzenegger and many more have also been White Hatted) ~ 2013. Voted ‘Male Runner Of The Year’ and awarded the ‘Golden Shoe’ from Canadian Running magazine ~ 2013. Medal of the City of Gloucester – the highest accolade the Mayor of Gloucester can bestow ~ 2013. Independent’s ‘Happy List’ – the top 100 happiest people in the UK ~ 2014. Ambassador of the Year at the Believe in Gloucester Awards ~ 2014. Named West Countries Pride of Britain ‘Fundraiser of the Year’ ~ 2014. Sat on the Surprise Surprise sofa with Holly Willoughby (not quite an award, but Jamie’s cheekiest honour yet!) ~ 2014. National Adventure Award Winner for ‘Fundraiser of the Year’ ~ 2014. Honorary Fellowship (one of the most prestigious awards that the School can bestow) from the University of Gloucestershire ~ 2015.